John and Kathleen Leebel of The Lewes Building Company (center) presented the check to Alex Sydnor, President/CEO, Beebe Medical Foundation (left) and Dr. Judith Ramirez, Manager, Psychosocial, Outreach, and Breast Health Center, Tunnell Cancer Center (right). 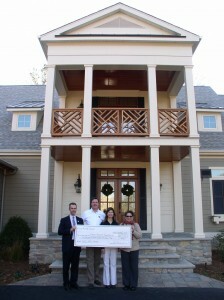 The Lewes Building Company recently presented Tunnell Cancer Center with a check for $6,523 from the proceeds of tickets sales from its Southern Living Showcase Home open house that took place the last week of November. The home is the first Southern Living home to be built in the mid-Atlantic region. Kathleen and John Leebel, owners of The Lewes Building Company, decided early on to designate the proceeds of ticket sales to the open house to benefit counseling services at Beebe Medical Center’s Tunnell Cancer Center. To learn more about Beebe Medical Foundation, please call 302-644-2900 or visit us online at www.beebefoundation.org. For more information about The Lewes Building Company, please call 877-797-TLBC or visit the company online at www.lewesbuildingco.com.